Each rodent possesses an amazingly efficient set of self-sharpening teeth. With more than 2,000 existing rodent species, untold numbers of rodents voraciously gnaw their food with razor-sharp teeth similar to finely honed knives. 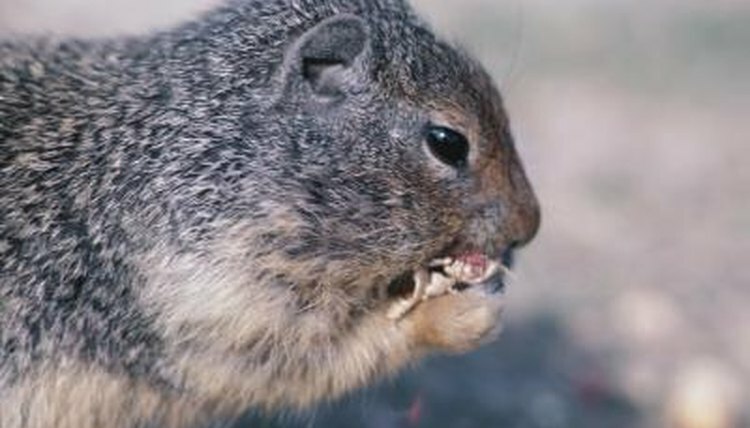 When the rodent dines on acorns and other hard-surface foods, the animal's incisors grind together, effectively maintaining a sharp enameled edge ideal for the next round of gnawing. The eastern chipmunk's movable feasts frequently include acorns, although these small rodents also consume seeds, berries, corn and fruits. If the chipmunk finds a bird egg, snail or young mouse, he eats those as well. Eastern chipmunks spend most of their time gathering and hoarding food for the winter. Although the chipmunk sleeps in his cozy den during the winter, the little rodent wakes up periodically to nibble at his food stores. Gray squirrels have achieved notoriety for their acorn consumption, although they also chow down on wild berries and fruits. In late summer, these ravenous rodents harvest delicacies such as white oak trees' acorns, beech nuts and tulip poplar cones. Gray squirrels also search for food all winter, sometimes finding acorns and other nuts they buried during the fall. Since the squirrels don't remember where they stored their winter snacks, a visiting squirrel with a keen sense of smell might discover the hidden treasure first. A deer mouse's miniscule size enables him to squeeze through impossibly small holes in your home's exterior. He often brings along his own food, busily carting acorns, beech nuts and pinecone scales into your home's interior walls. Although the deer mouse doesn't take up much space, you might be unnerved by his scratching and gnawing sound effects. If he expires in your walls, you'll notice an unpleasant odor as well. Woodland voles spend considerable time in cozy underground burrows with entryways camouflaged by leaf piles or grass clumps. The mouse-sized voles often move into other small mammals' nests that provide two or more escape routes to the surface. Woodland voles transport acorns, nuts and tuberous grass roots to their underground dens, where they eat while lying down. The voles spread their food on their nest's floor and gorge at their convenience.